The Captain Knows Where The Fish Are! You will get to enjoy the comfort of fishing out of a roomy 23ft Hurricane Deck boat, that has a full Bimini Top to protect you from inclement weather and the blistering sun. The Captains boat is powered by a 2016 Yamaha V-Max 225 and equipped with second to none 7ft Ugly Stik Rods, 6500 Class Abu Garcia Reels and a Top of the line Touch Screen HDS 12 Lowrance Fish Finder. For 20 years I’ve fished hard for Striped Bass,on Smith Mountain Lake and I will be the first person to tell you when it comes to fishing, some days are better than others. I will assure you that everyday, I will give it 100%. 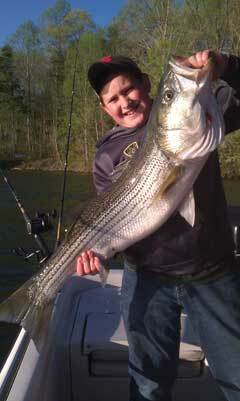 Smith Mountain Lake is one of the largest citation producing lakes for striped bass fishing on the east coast! While fishing the 20,000+ acre lake, with Captain Wendell Dudley, you can experience the fun of live bait fishing for striped bass. I will share with you the many fishing techniques used for making your trip a success! Striped Bass or Rock Fish are of significant value as sport fishing. They have been introduced to many water ways outside of their natural range. Striped Bass were introduced to Smith Mountain Lake in the 1960’s and is one of the most sought after fish in the lake. Because Striper are stocked in Smith Mountain Lake, they are known as “land locked” Striper. Land locked striper have a hard time reproducing naturally, but still continue the natural spawn. Spawning takes place during the spring of the year, April thru May. Unfortunately, there is a slot limit of the size Striper that are ale to be kept from Oct 1st thru May 31st. The slot limit requires that Striper between 26 to 36 inches are to be released during the months mentioned. You are definitely still able to enjoy the thrill of catching and releasing fish of that size.